Throughout the semester, I have had many amazing experiences while doing classroom facilitation. One lesson that sticks out to me was the “How Can I Stay F.I.T” lesson for two of Jennifer McAdams’ 12th grade English classes. Prior to the lesson, I discussed my plans with Mrs. McAdams, and we thought it would be a great idea to take some of the lesson outdoors. 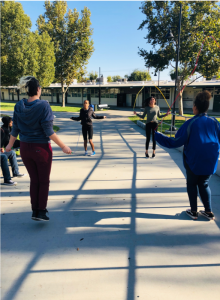 As seniors, these students get little to no physical activity during school, so it was very exciting to get them outside. We started the lesson in the classroom where we discussed ways to implement different types and levels of physical activity into the daily routines of the students. 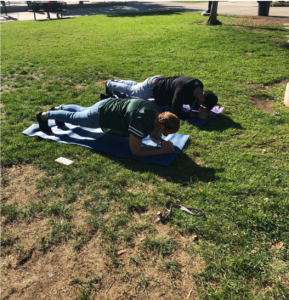 Students were interested to learn about different types of exercise that they can implement as they approach the start of college. Students were shocked when they found out we would be headed outside for half of the class period. We walked over to the courtyard, and I explained the different activities that we were going to have available. The students were given the chance to engage in jump rope, hula hoop, plank, and push up competitions. Although they were having fun, the students were even more excited to watch Mrs. McAdams and I battle it out in a planking competition. Mrs. McAdams took me down in the competition and is now deemed the “Plank Queen”. It was great to watch the kids get active and work up a sweat. The experience was far different from what they were used to doing in English class. I received positive feedback from students such as thanking me for taking them outside to get active. It is my hope they find a physical activity that is enjoyed and use it to stay fit as they enter their first year in college. It is such a rewarding experience to see all of the students have a blast during the HealthCorps activities. I am excited to continue guiding the students in making healthier choices whether that is in nutrition, physical activity, or mental resilience.